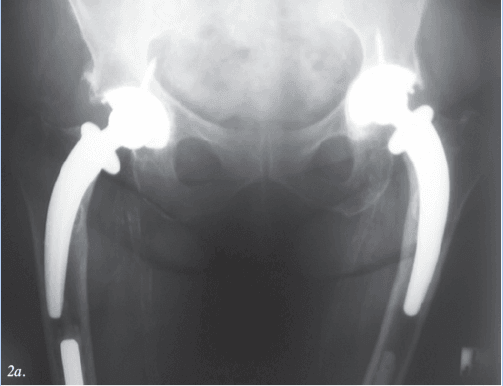 A patient presents with bilateral hip pain necessitating bilateral total hip arthroplasty. But previous bilateral revision total knee arthroplasty with long-stemmed implants has left little room for traditional hip implants. Achieving stable fixation in total hip arthroplasty (THA) in the presence of limited proximal femoral bone stock is a frequent challenge in the revision setting, but is less common for primary THA. 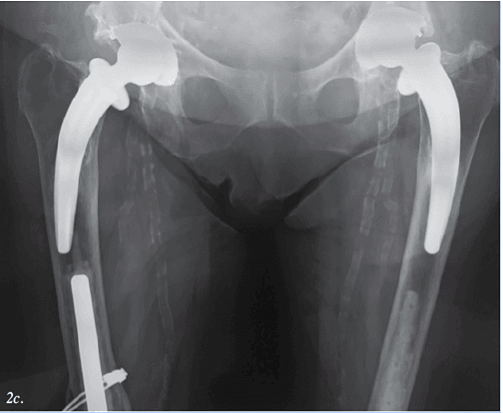 We describe an uncommon scenario in which options for femoral fixation of a primary hip arthroplasty were limited, as the femoral diaphysis was almost completely filled by a long stemmed revision knee replacement. Conventional hip arthroplasty components have historically used stems greater than 150 mm . Several companies have introduced shorter versions of a conventional stem design with lengths less than 150 mm . These are frequently used in Asian patients with short stature who often have a narrow femoral diaphysis and curved femurs that conflict with traditional length stems. Hip resurfacing and metaphyseal stems that do not enter the diaphysis are design alternatives to conventional stems. Metaphyseal stems are short curved designs that preserve some of the calcar femoralis and attempt to load the proximal femur in a more physiological manner [3, 12]. Short stems and resurfacing implants have an occasional indication for treating hip joint pathology associated with femoral deformity, such as after femur malunion or osteotomy . The described case highlights the conflict of insufficient diaphysis available for hip implant fixation. A 63-year-old female patient presented with incapacitating bilateral hip pain. She had significant co-morbidities, including rheumatoid arthritis, steroid induced osteoporosis, and diabetes. Her Charnley grading was C.
She had undergone bilateral primary total knee arthroplasty 3 years prior to presentation. One year following her primary knee arthroplasty procedures, she sustained bilateral distal femoral fractures after a fall. These fractures were managed by revision knee arthroplasty. Her left knee was revised with a long-stemmed condylar femoral prosthesis; the right knee was revised with a very long-stemmed condylar femoral prosthesis that ended 10 cm from the lesser trochanter. This was combined with a strut allograft. At presentation, the patient was able to ambulate minimally with a frame. Her presenting problem was incapacitating bilateral trochanteric and groin pain, with deteriorating weight-bearing capability and rest pain. Physical examination showed a frail patient with a crouched stance and a support-dependent stiff-hip antalgic gait. Both hips had audible crepitus on movement, fixed flexion deformities with limited flexion, and no rotation. Her right knee had a range of motion of 35° to 80°; her left knee, 35° to 85°. Initial radiographs showed bilateral cemented revision knee arthroplasties that filled most of the femoral diaphyses. There was also severe generalized osteopenia with rheumatoid changes in both hips, including protrusio acetabuli and complete chondral space loss. Preoperative templating showed that a prosthesis with a traditional stem length could not be accommodated due to the stemmed knee component (Figure 1). Therefore, a shorter neck-preserving implant was selected. Figure 1. Radiographs showing limited proximal bone on the right. Preoperative templating with a stem of conventional length overlying a long-stemmed revision knee component (Figure 1a, left). Preoperative templating with a short stem femoral prosthesis (Figure 1b, right). The patient underwent a right THA using the posterior approach. A LINK TOP cementless acetabular cup and CFP (Collum Femoris Preserving) short stem were used (Waldemar Link GmbH & Co, Hamburg, Germany), with intentional lengthening of 15 mm to restore her premorbid length. Six weeks postoperatively, the patient had a marked improvement in right hip function, with no pain and an improved range of motion. However, she continued to have difficulty in ambulating due to the left hip pain and stiffness. The left hip was then replaced 3 months following her right hip surgery with the same implant type and sizes. No postoperative complications were observed. At 1 year after surgery, the patient reported an improvement in her quality of life and was observed to be ambulating faster with a frame in a more erect position. At 5 and 11 years post-surgery, the patient was very content with her hips, and also felt that she had improved knee motion, which was attributed to the resolution of the preoperative hip flexion deformities that had induced her crouched posture. Serial radiographs at 1, 5, and 11 years after surgery demonstrated stable implants (Figure 2). Figure 2. Bilateral total hip arthroplasties with uncemented short-stem prostheses proximal to long-stemmed revision knee components. Calcar resorption and proximal diaphyseal hypertrophy progresses to 11 years post-surgery. One year following surgery (Figure 2a, top), 5 years following surgery (Figure 2b, middle), and 11 years after surgery (Figure 1c, bottom). The femoral component of a THA serves an essential role in transmitting the forces generated at the center of rotation to the proximal femur. The femoral component historically has a segment that engages the femoral diaphysis, with a variety of lengths being used [6,8,17,18]. The LINK CFP (Collum Femoris Preserving) prosthesis is a type 2, or “neck stabilized,” short stem. It is an uncemented prosthesis that preserves the femoral neck and proximal cancellous bone, and it was primarily developed for biologically young and active patients. Pipino et al, who developed the CFP short stem, reported excellent (82%) clinical mid-term results . At 25 years,  he reported 97% “good” clinico-radiographic outcomes and a survival rate of almost 100%. Pipino proposed that preserving “healthy” tissue, which includes the femoral neck, has the advantage of maintaining the osteo-articular architecture that would maximize mechanical stability and optimize distribution of mechanical loads, which will then favor enhanced osteointegration and bone remodeling. This patient was neither young nor active, and had osteoporosis, all of which are relative contraindications for a neck-preserving short stem prosthesis. The decision to use a short-stemmed implant in this patient was controversial, but it was made after careful consideration of the patient’s limited and high-risk options. She had undergone previous bilateral revision knee arthroplasties and the long stems of her femoral components had consumed most of the femoral diaphysis. This case emphasizes the importance of preoperative templating, which clearly showed that the use of a stem of conventional length was not possible. The alternate surgical option was to also revise her functioning long-stemmed knee components, which could eventually result in total femoral replacement. Acknowledging the relative contraindications associated with her suboptimal bone quality, the authors elected to proceed with a less-invasive surgical option and use a short-stemmed press-fit device. This case emphasizes the importance of preoperative templating as part of preoperative planning. 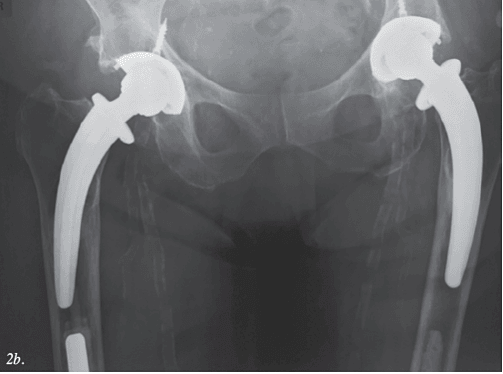 It also demonstrates that when confronted with limited high-risk options, a short-stemmed device can be successfully used to permit hip arthroplasty in the presence of inadequate femoral bone stock as a consequence of previous surgery or deformity. Ai E. Gamboa; David G. Campbell, BMBS, PhD, FRACS (Orth A), FA; and Peter L. Lewis, MBBS, FRACS, FA, Orth A are from The Wakefield Orthopaedic Clinic, Adelaide, Australia. 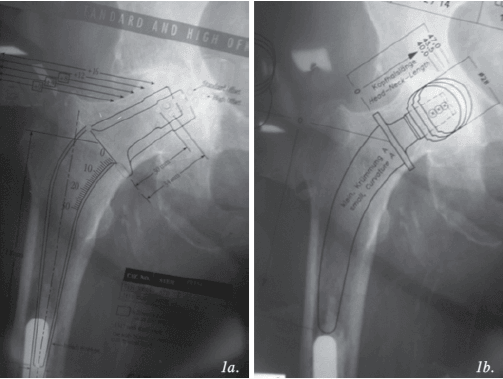 Gamboa A, Campbell D, Lewis P. Short-Stem Hip Arthroplasty as a Solution for Limited Proximal Femoral Bone Stock. Reconstructive Review. 2015;5(2):43-45. http://reconstructivereview.org/ojs/index.php/rr/article/view/114/121© 2015 JISRF. All rights reserved. All articles published are the shared property of its authors and Reconstructive Review. The Journal allows authors to share publishing rights without restrictions. Reconstructive Review follows the Creative Commons Attribution-NonCommercial-NoDerivs CC BY-NC-ND. This license allows others to download works and share them with others as long as they credit Reconstructive Review and the Joint Implant Surgery & Research Foundation (JISRF), but they can’t change them in any way or use them commercially.